The errors associated with mapping depend strongly on how close to the horizon we choose to work. Working in a very small region directly under the spacecraft provides very poor coverage but excellent mapping accuracy and resolution (see Fig. 5-21). On the other hand, working near the horizon provides very broad coverage but poor mapping accuracy. Thus, we must trade resolution and mapping accuracy for coverage. The mapping accuracy for a particular mission depends on thé spacecraft's elevation angle at die edge of the coverage region. In almost all cases the mapping accuracy will be much better looking straight down, and the limiting accuracy will be closest to the horizon. To assess satellite coverage, we look at the satellite's swath width. That is, we assume the spacecraft can work directly below itself and at all angles out to a limiting spacecraft elevation angle as seen from a target on the ground. Accuracy characteristics as a function of elevation angle are more complex because they involve combining several terms. 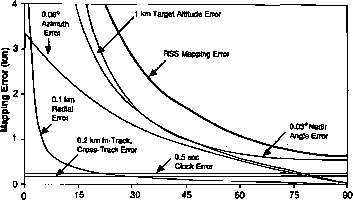 A sample plot of mapping error as a function of the spacecraft's elevation angle for a satellite at 1,000 km is in Fig. 5-22. This figure is based on the equations in Table 5-6. Fig. 5-21. Swath Width vs. Spacecraft Elevation Angle for a Spacecraft at Various Altitudes. Note that the swath width increases dramatically at small elevation angles. The uncertainty in target altitude typically contributes most to determining a geographic location on the Earth. The oblateness of the Earth has the largest effect on target altitude. It causes a variation in distance from the center of the Earth of approximately 25 km between the poles and the equator. But we can account for this factor analytically at very low cost, so it does not usually add to the error. The next plateau is for aiiplanes, clouds, or other atmospheric features. The uncertainty in target altitude at this level will typically be 10 km or larger unless we have some a priori estimate of the altitude. For features on the Earth's surface, the uncertainty in taiget altitude reduces to approximately 1 km, unless data analysis includes a detailed map of target altitudes. Figure 5-22 incoiporates this 1 km error in target altitude as the dominant source of error. Thus, for example, for FireSat to have a mapping error of less than 1 km would require one of two arrangements. The spacecraft could work only very near nadir and therefore have very poor coverage. Alternatively, it could include the elevation of the target region as a part of data reduction, therefore requiring the use of a very large data base and making the data processing more complex. Fig. 5-22. 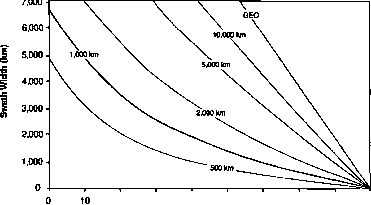 Mapping Error as a Function of Elevation Angle for a Spacecraft at 1,000 km Altitude. Magnitudes of assumed error sources are marked. Fig. 5-23. 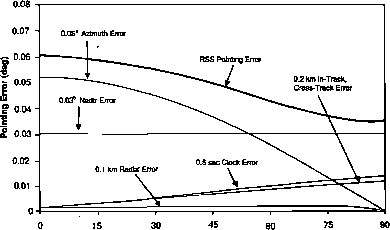 Pointing Error as a Function of Elevation Angle for a Spacecraft at 1,000 km Altitude. Magnitude of assumed error sources are marked. Using these general limits in a model such as that of Fig. 5-22 allows us to assess accuracies as a function of cost and coverage. Unlike mapping, pointing depends only weakly on the spacecraft's elevation angle. (See Fig. 5-23.) Thus, for missions which require only pointing, working in a region near the horizon is almost as easy as pointing to a target or ground antenna at nadir. In this case the working limit on the spacecraft's elevation angle depends on other factors, such as the transmission of the atmosphere for a selected wavelength or possible obstruction by local geography. For example, ground stations ordinarily limit their elevation to approximately 5 deg above the horizon because of the reduced atmospheric transmission at lower elevation angles. Pointing requirements normally arise from the spacecraft's housekeeping functions or from the need to point a particular instrument or antenna toward a ground target Housekeeping requirements such as solar array pointing and orbit maneuvers ordinarily demand pointing accuracies of 0.25 to 1 deg. Consequently, for most missions, the need to point the mission sensor or antenna is more important. Here again two cases exist If we wish to point the sensor at a single target, then we will generally try to point the center of the sensor at the target By doing so, we establish a pointing requirement to place the target within the field of view. Specifically, if the payload sensor's field of view is four times the 3<rpointing error, then the target will lie within the field of view with a 6o probability, or virtual certainty. For example, if the FireSat sensor has a 1 deg square field of view, an overall pointing requirement of 0.25 deg will assure that the target will be within the field of view. In pointing we may also want to eliminate overlapping coverage. For example, if we wish to take a series of pictures, we must overlap the pictures by more than the pointing error to ensure continuous coverage of the ground. This requirement, in turn, implies that the spacing between pictures must equal the field-of-view size less the pointing error. Thus, with a large pointing error, we must accept having fewer pictures at a given time and increased resource costs in terms of time, power, and data rate for a given level of coverage. It is common to have a pointing accuracy of 10% to 20% of the field-of-view diameter. Driving the pointing under 10% of the field-of-view diameter will only slightly improve overall coverage. On the other hand, a pointing error worse than 20% of the field-of-view size can require substantial overlap, thus greatiy diminishing the overall system's coverage and resource utilization. Collins, Steve. 1992. 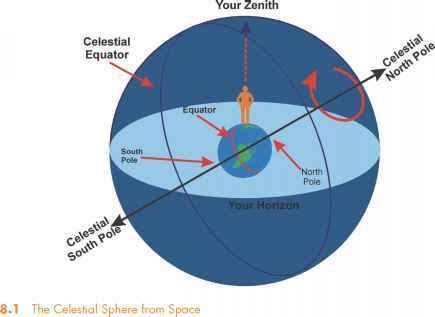 "Geocentric Nadir and Range from Horizon Sensor Observations of the Oblate Earth." AIAA Paper No. 92-176 presented at the AAS/AISS Spaceflight Mechanics Meeting. Colorado Springs, CO, Feb. 24-26. Green, R.M. 1985. Spherical Astronomy. Cambridge: Cambridge University Press. Liu, K. 1978. "Earth Oblateness Modeling," in Spacecraft Attitude Determination and Control, ed. James R. Wertz. 98-106. Holland: D. Reidel Publishing Company. Roy, A.E. 1991. Orbital Motion (3rd Edition). New York: John Wiley and Sons. Smart, WM. 1977. Textbook on Spherical Astronomy (6th Edition). Cambridge: Cambridge University Press. Wertz, James R. 1981. "Global Geometry Techniques for Mission Analysis," in Proc. Int. Symp. Spacecraft Flight Dynamics, Darmstadt, FRG, May 18-22 (ESA SP-160, Aug. 1981). _. 2001. Mission Geometry; Orbit and Constellation Design and Management. Torrance, CA: Microcosm Press and Dordrecht, The Netherlands: Kluwer Academic Publishers.